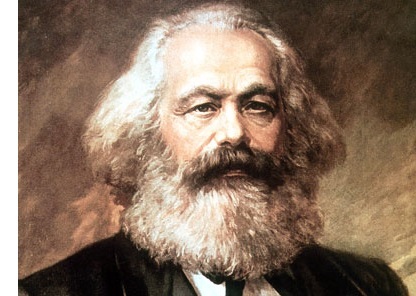 Karl Marx (1818-1883) - Karl Marx is the man credited with being the original revolutionary socialist; a term which refers to the radical transition from a market based society to a socialist one. Socialism is a somewhat ambiguous term which gets bandied about in present-day conversation, but in its simplest definition, it essentially means a system whereby an entire society works in conjuction for the benefit of that society. The great political/ideological struggle which began with the Russian Revolution (see Russian Revolution below) and dominated the second half of the 20th century can be traced back to Marx. He was born in the city of Trier in the Kingdom of Prussia and studied to be a lawyer at the Universities of Bonn and Berlin; though he never practiced law. After school he began writing for a radical newspaper called the Rhineland News. It was here that he began formulating and articulating his views on socialism. In 1844 he met Friedrich Engels who would become his lifelong friend and ideological partner. They co-authored the Communist Manifesto (1848) and Das Kapital (1867) which today are considered standard texts for socialist philosophy. Both were critical of capitalism which they viewed as an unfair system, and laid out the tenets for an alternative system based on workers' rights. The key in their view was controlling the means of production. In a capitalist system, production was controlled by business, in a socialist system it was controlled by the worker. In this respect, Karl Marx could be considered Adam Smith's foil. Smith argued that capitalism brought more freedom to a nation's workforce, while Marx argued that it brought less. As the accepted father of this ideology, it commonly bears his name - Marxism. Of course, it can be known by several names. Communism is considered a more hard-line form of socialism. After the Russian Revolution of 1917, his name was often grouped with that of Vladimir Lenin to create the term Marxism-Leninism. The term gives credit to Marx for conceiving the theory and Lenin for putting it into practice. Over the years, as it has been tried elsewhere, it has expanded even further to include names like Stalinism, Maoism, et al.